Addicted to Mexican Food? Carnitas will satisfy the craving! I have an addiction to Mexican food. I want to eat it all the time. I could eat it all the time. But the problem with making homemade Mexican food (at least for me) is that it doesn’t always taste super authentic. Well, I found this recipe on Pinterest and it has solved my problem. This recipe is perfect so I don’t ever change a thing. 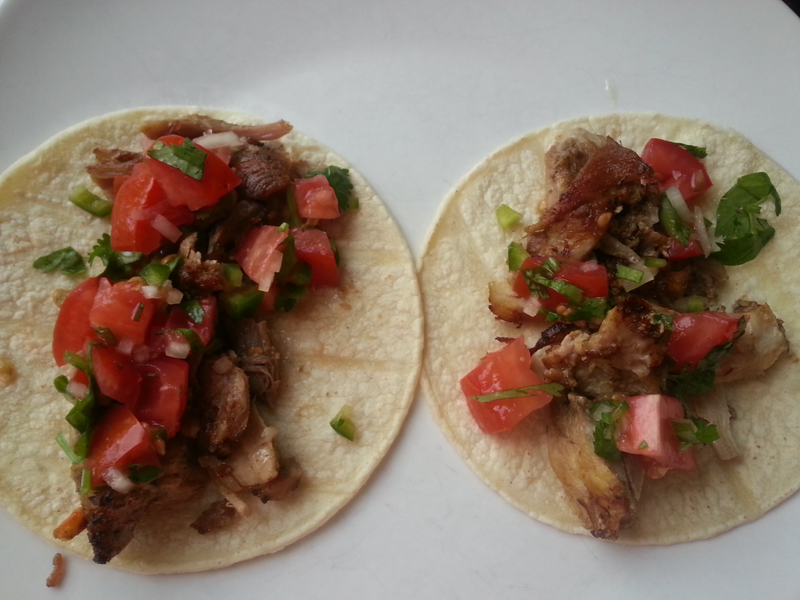 To get the directions for these delicious carnitas, and check out other amazing recipes, please head over to My Kitchen Escapades. I think this dish will ABSOLUTELY satisfy that craving. Give it a try! 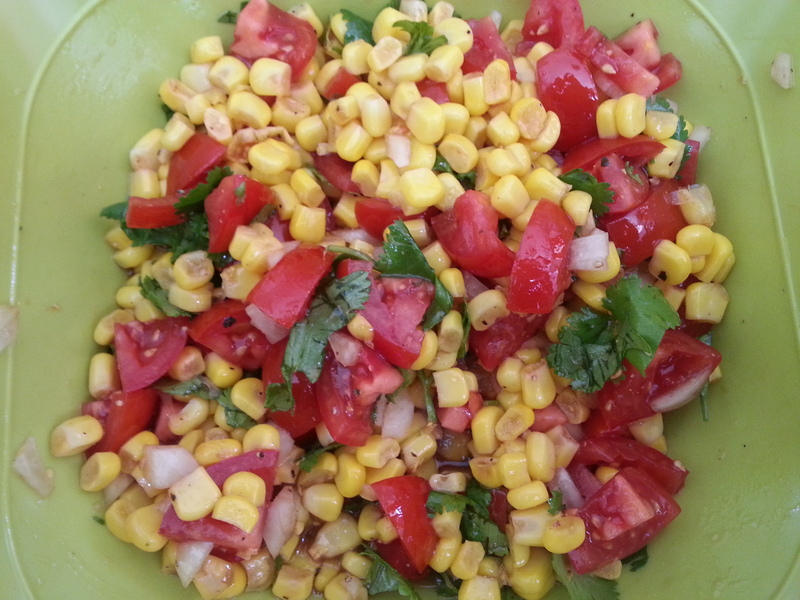 This, my friends, is a summer staple! It goes great with Mexican food as well as good ole’ American BBQ food. 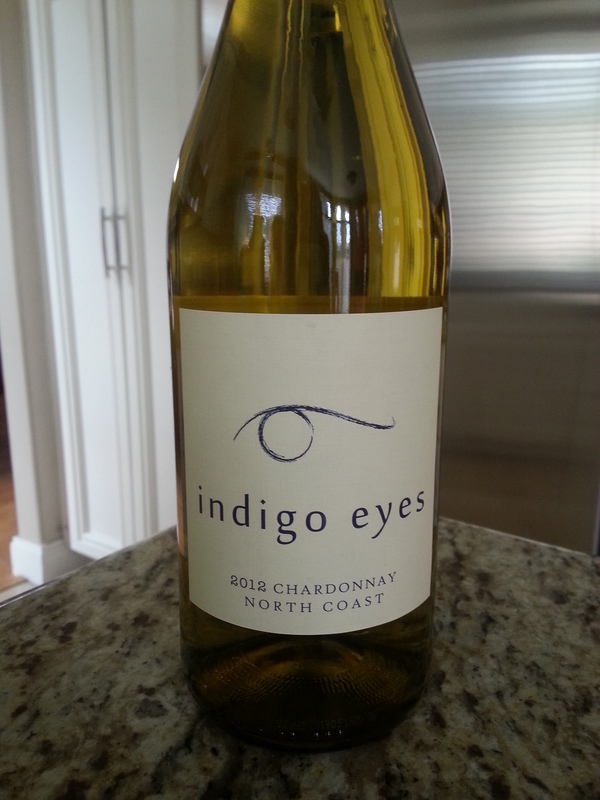 With bright colors and fresh flavors, it’s the perfect side dish to serve at your next gathering. Add the first five ingredients into a bowl and squeeze some lemon over the top. 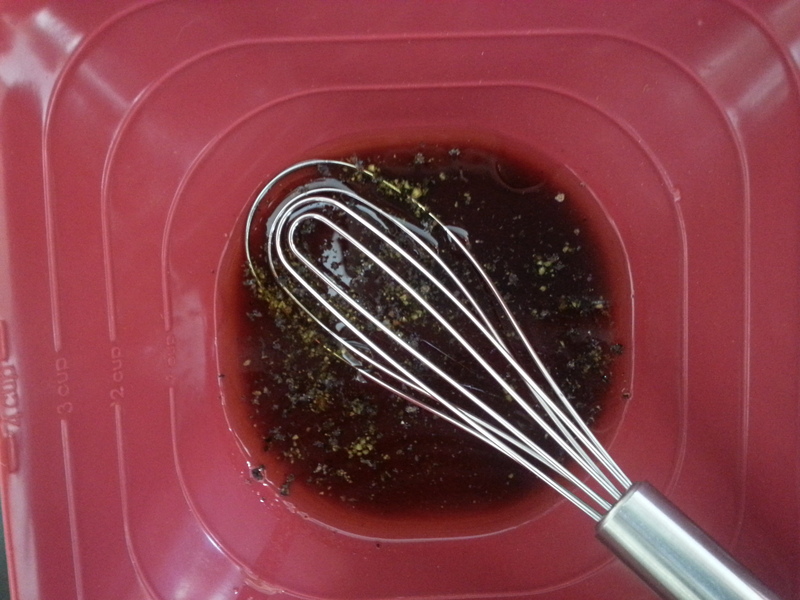 In a separate bowl, add the remaining ingredients and whisk until blended. Pour the dressing over the salad and mix together. Refrigerate until ready to eat. Now, I know it’s not summer just yet. But where I live, it’s already starting to feel that way. Hope you’re enjoying the weather, wherever you may be! 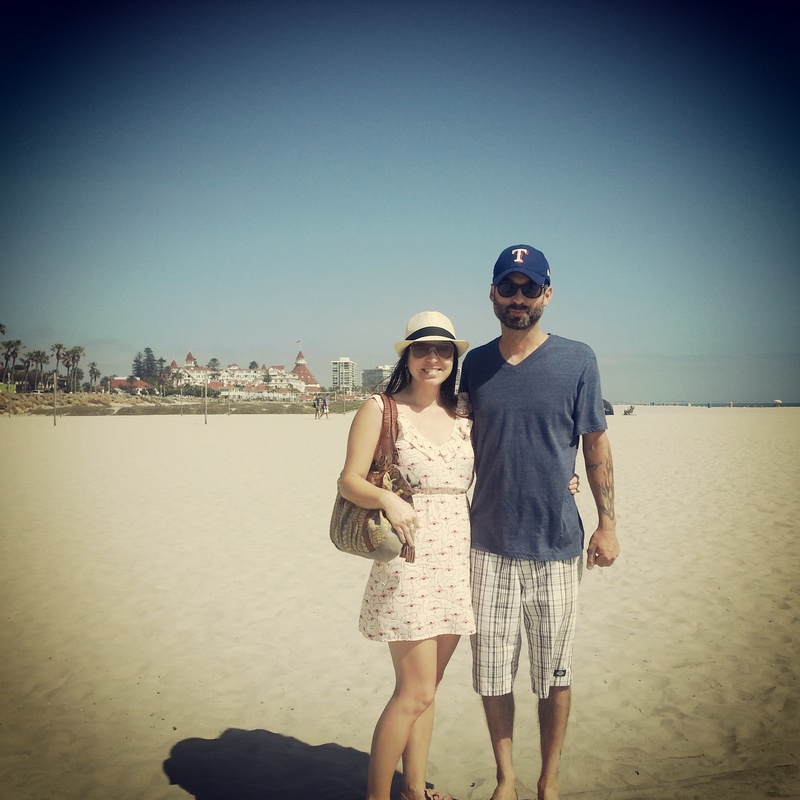 My hubs and I celebrated our 10 year wedding anniversary this weekend in San Diego. Child free! And we had an amazing time. 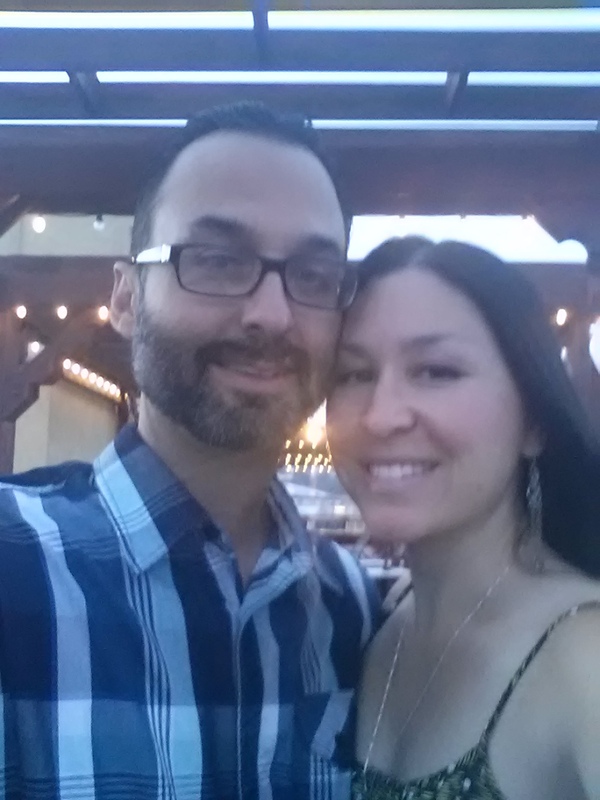 Spending some time without the kids is much needed and this was only our second time EVER in the history of “us”. I’m hoping we have more adult trips in the future! One of the many things Adam and I have in common is our love for food. Good food! And we were very fortunate to have some delicious fare on our mini vacay. No recipes to share with you today, but I’m feeling a re-creation of the sandwich I’m about to show you in the near future. 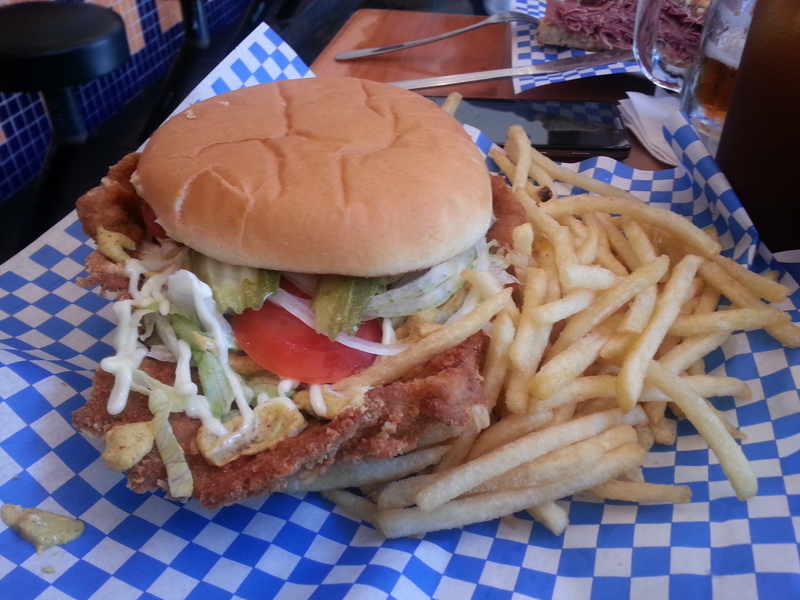 This is a crispy pork tenderloin sandwich and it was probably the best sandwich I’ve ever had. It looks monstrous and it was. I went into it thinking I would only eat half. Who was I kidding? I can really put away the food! I ate almost every bite of that damn thing. And loved it! Whoever was creative enough to come up with this lovely concoction is my hero. I’ve never had anything like this before. 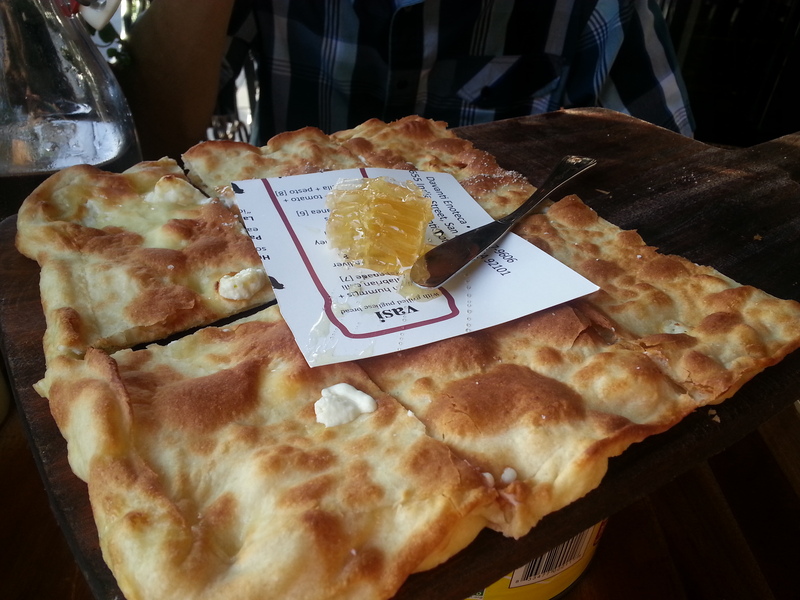 It’s very thin focaccia bread with fresh soft cow cheese baked into it. And served with honeycomb. Yes, you read that right. HONEYCOMB! That you slather over the top of the bread like butter. It was out of this world good. Surprisingly, those are the only food pictures I took! But I got some good ones of the scenery. 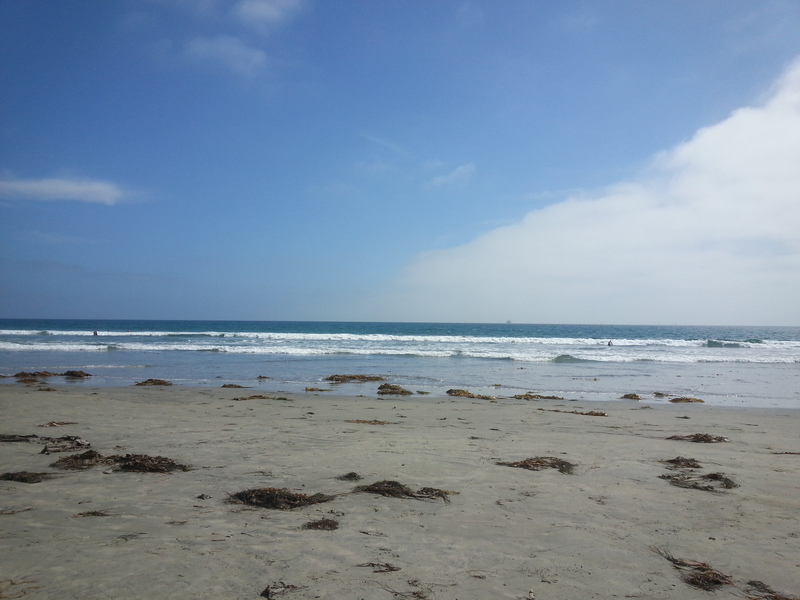 Coronado Beach. Beautiful clean, white sandy beach. Need I say more? This was from the rooftop deck of our hotel. 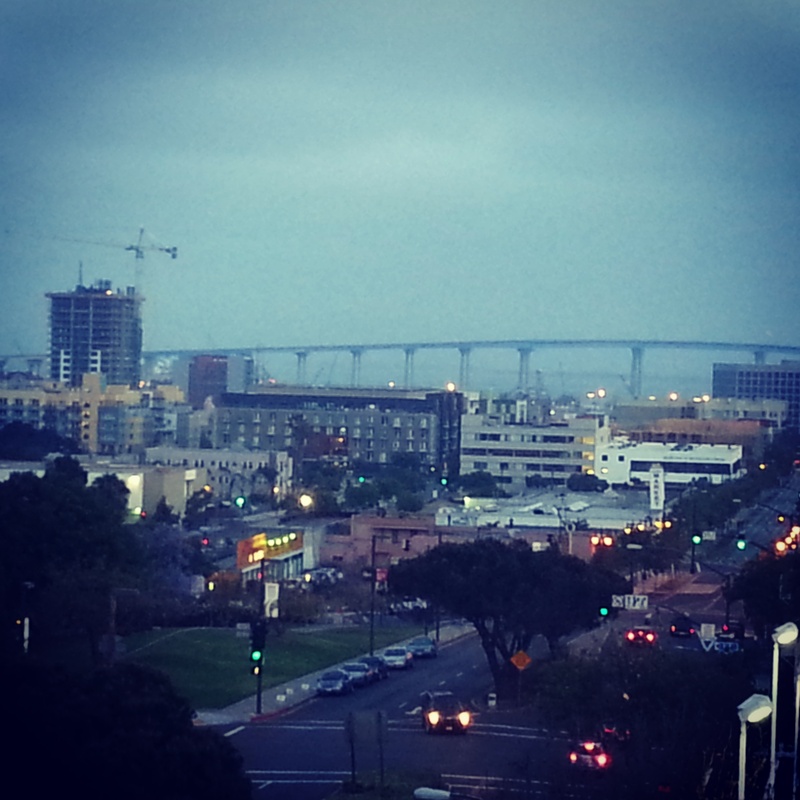 Great view of Coronado Bridge and Downtown SD. Rooftop selfie on our last night away. I love this man. Hopefully in the future I’ll be posting a recipe for that pork tenderloin sandwich. I may also attempt that bread too! 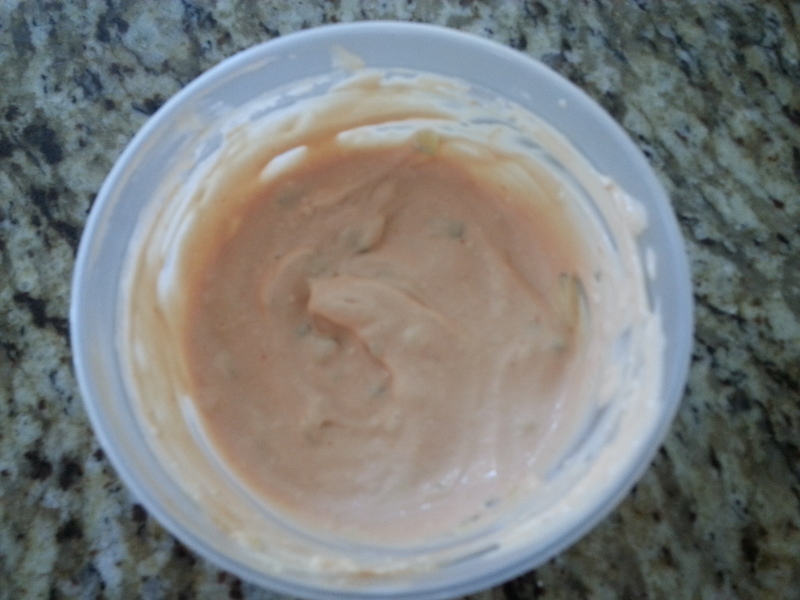 My youngest refers to 1000 Island dressing as Thousand Islands. I keep correcting her, but it’s just not taking. She really likes this dressing, as does her mommy. 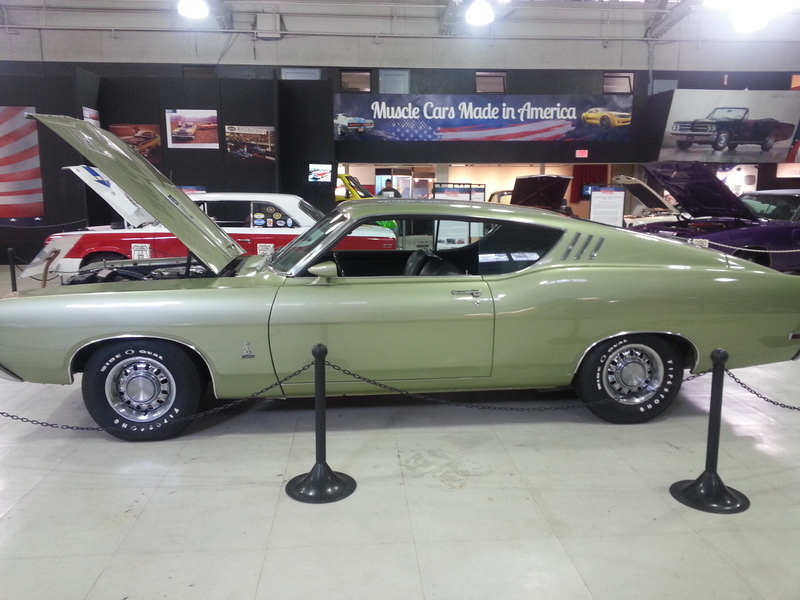 It’s one of my faves. My husband doesn’t understand my love for this dressing even though he basically demands it for our burgers. Hmmm… I think he has a secret love affair with Thousand Islands. Since then, I’ve made Thousand Islands a lot and have jazzed it up just a bit. But of course, it’s still so simple, fast and easy. 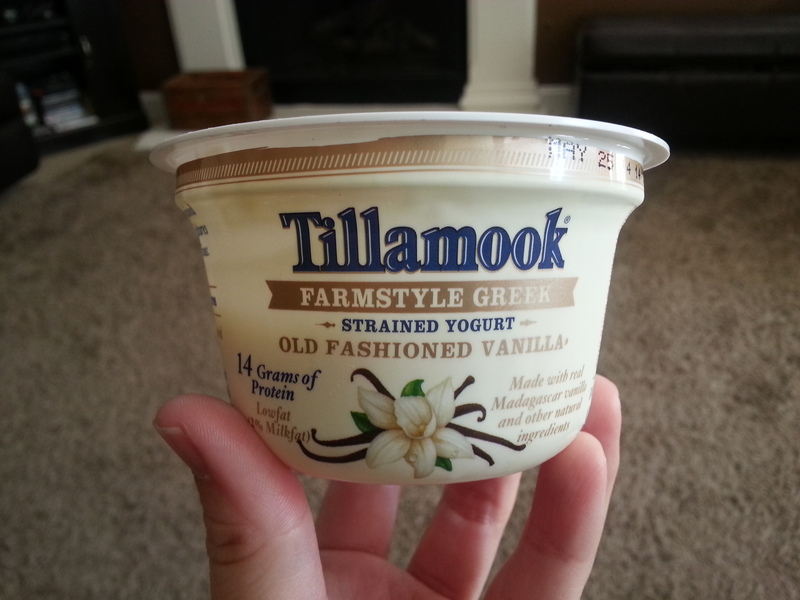 I love it on burgers, salads and dipping my pizza in it. Don’t knock it till you try it! 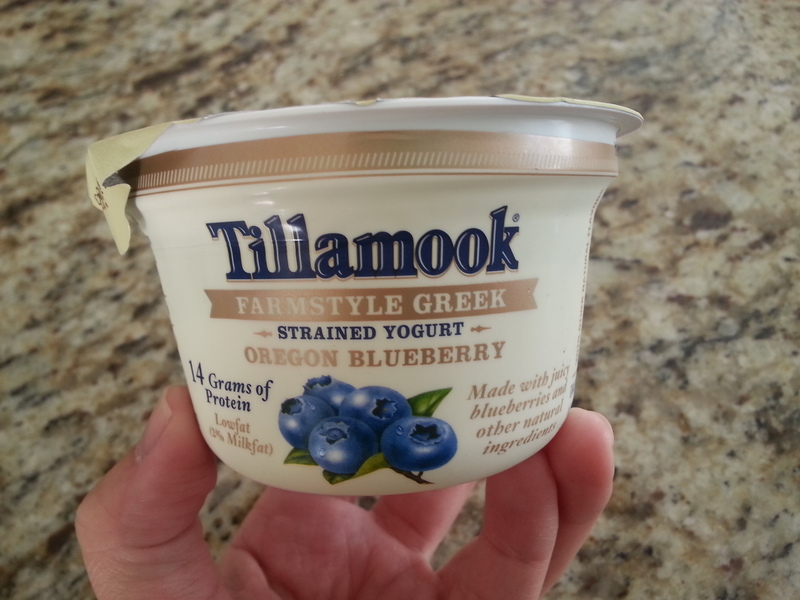 It’s great on a lot of stuff. I mean, it has mayo in it. What has mayo in it that isn’t good? 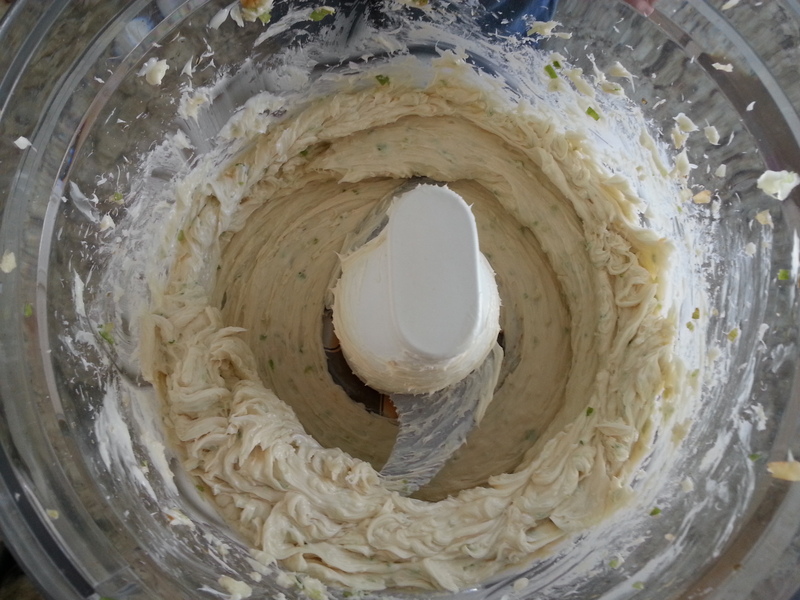 Whisk all ingredients in a bowl until smooth and refrigerate until ready to use. Begin your love affair with Thousand Islands. I’m going to keep on, keeping on. A grill post, AGAIN! But yes, the weather is right and when it is, we GRILL! 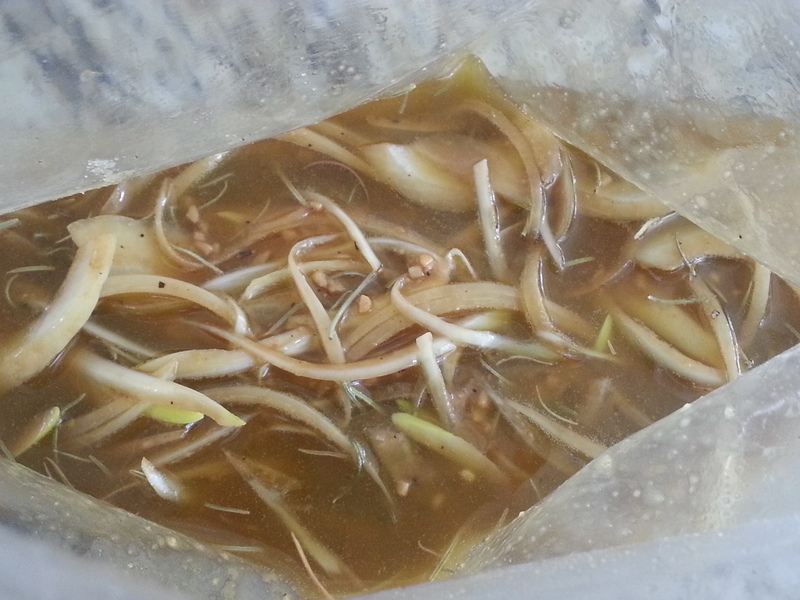 This is my go to marinade for rib eyes. Which happens to be my favorite steak, besides filet mignon of course. I have to tell you that my dad is a butcher and has been my whole life. So I’ve had a love for steak since childhood! This marinade may sound like it has a lot of ingredients but most likely, you should be able to find these items inside your pantry and fridge. Nothing too special but oh my, does it really flavor the meat! 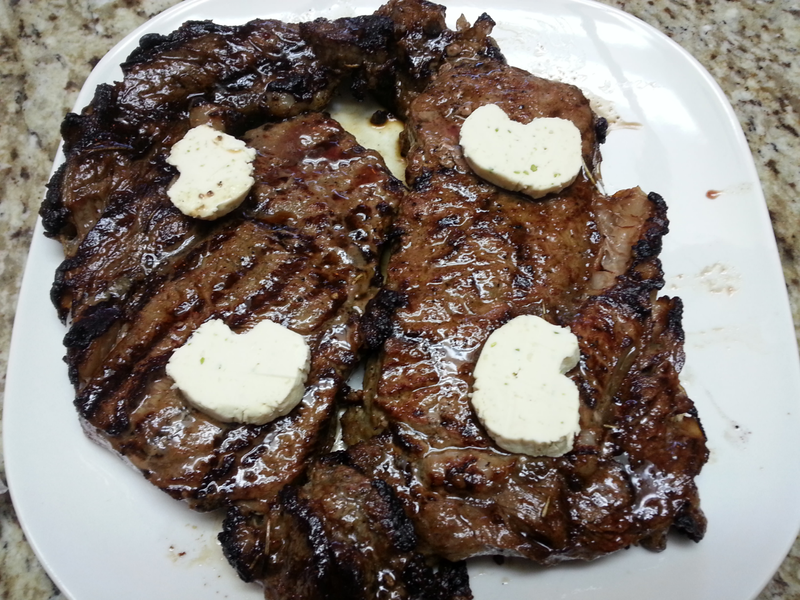 If that wasn’t enough, I made a compound butter to melt over the top of the steaks after they came off the grill. Is your mouth watering now?? Just a quick note about flavored butter/compound butter. Make this at home! I’ve seen commercials lately for this one specific brand in particular and I’ve also seen it at the store. And it’s expensive. 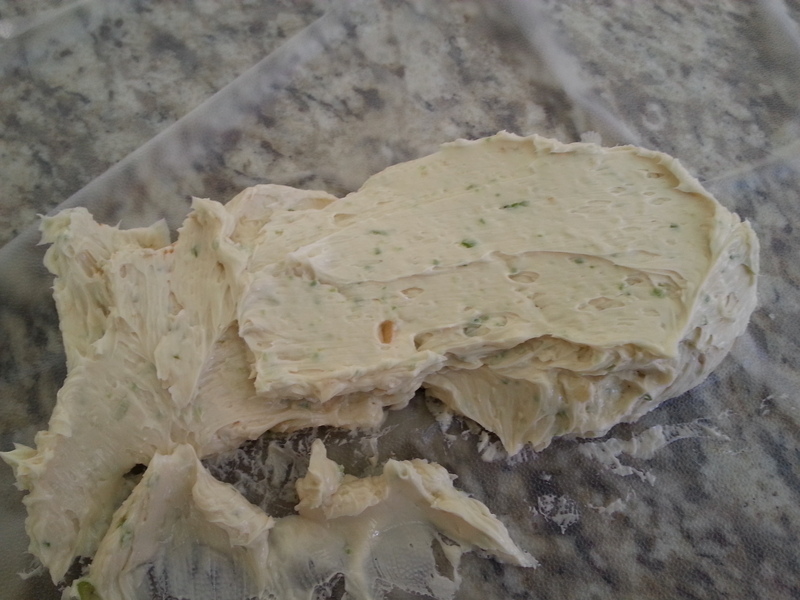 Compound butter is so incredibly simple and easy to make at home and you can completely make it your own. So please do try it. 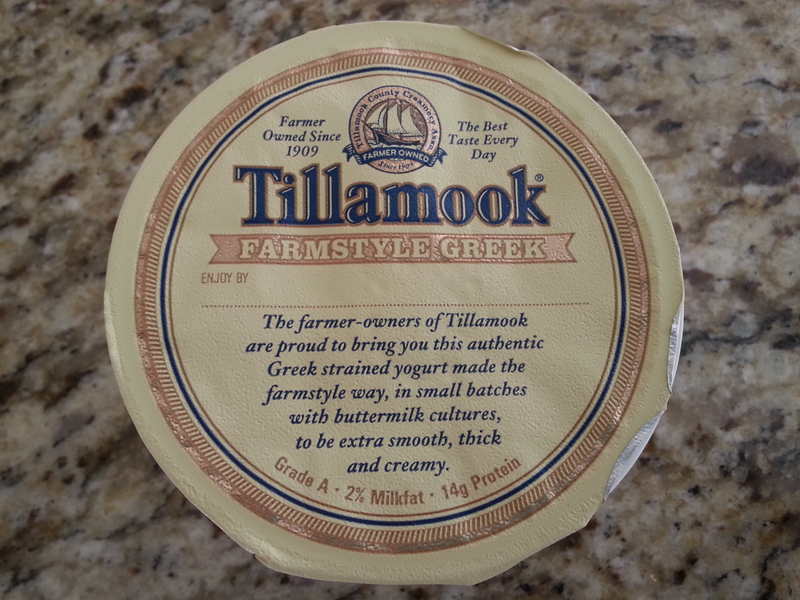 This butter is also amazing on shrimp and chicken. Potatoes too. And roasted veggies. Well, mostly anything. It’s that good. 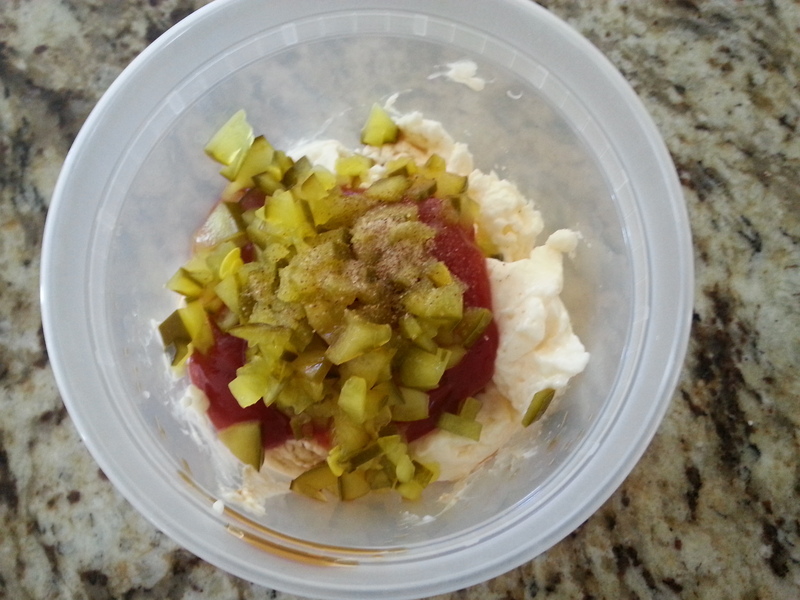 Place all ingredients in a gallon sized Ziploc bag. 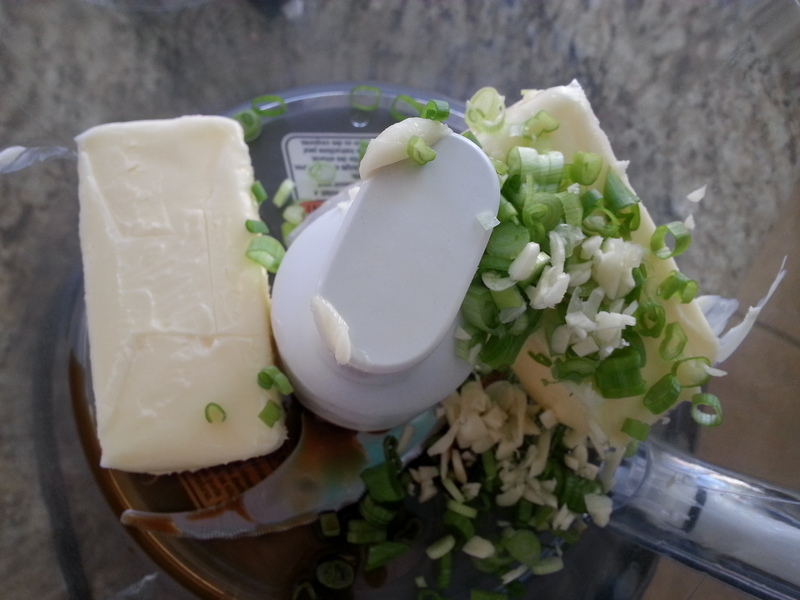 Whisk together until combined and then add steaks. Place in fridge for at LEAST 6 hours, turning over once. Time for the next component in the dish. Butter. And with goodies in it. Try to make a log shape. Key word, TRY! 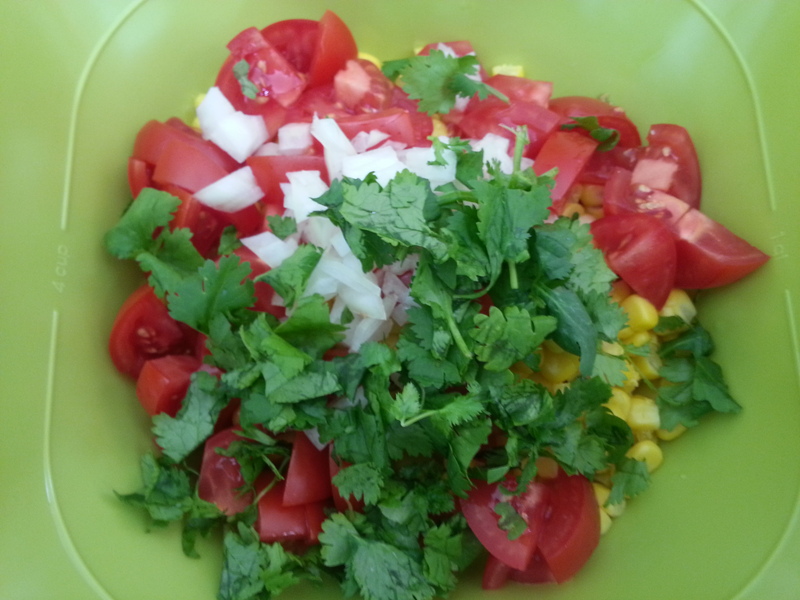 Place all ingredients in a food processor and pulse until nicely blended together. 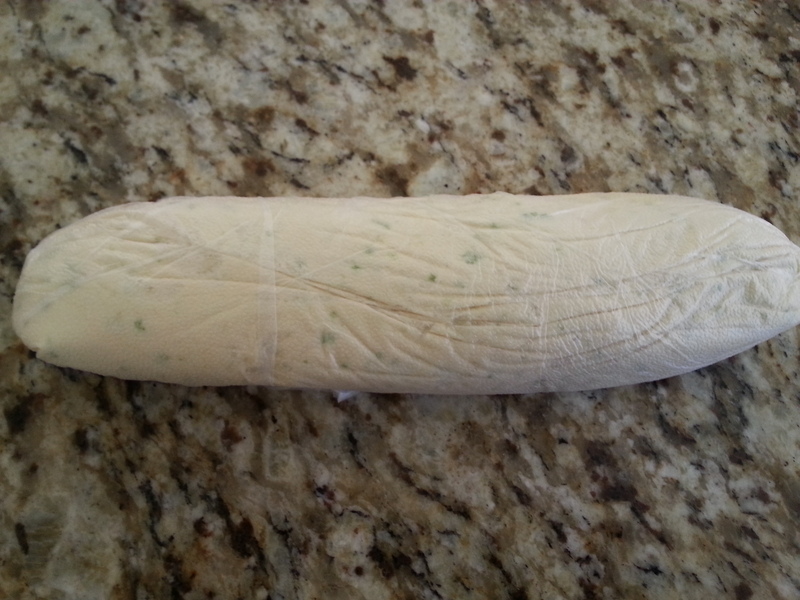 Spoon butter onto plastic wrap and roll up into a log/cylinder shape. Put in fridge until ready to use. This butter keeps really well in the freezer too. 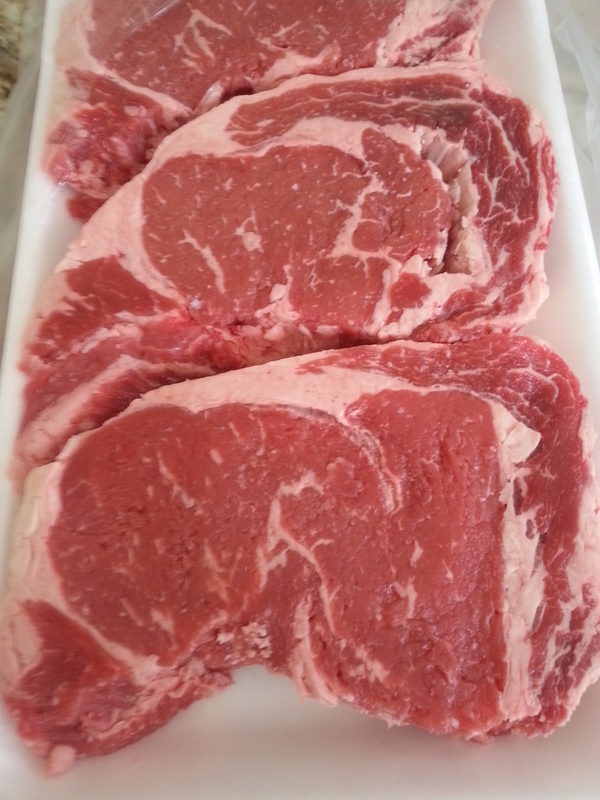 To make the steaks : 30 minutes before you want to grill, take those steaks out and let come to room temperature. Preheat your grill or grill pan to medium or around 325 degrees. We cooked our steaks about 5 minutes per side, but they were really huge steaks! Like I’ve said before, I typically don’t time how long we cook our steaks so this is approximate. But we like our steak medium rare. 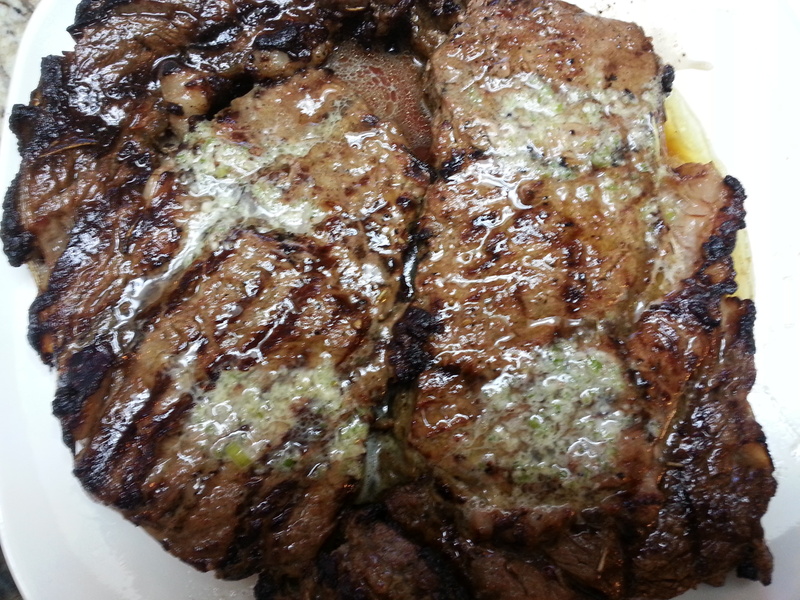 After steaks are cooked, place on a plate and slice off some of that butter and put over the top. Cover with foil and let rest about 15 minutes. 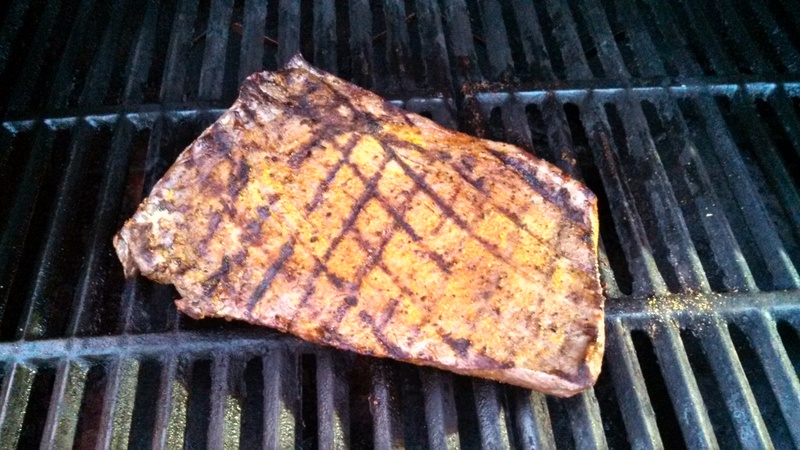 That butter will melt beautifully on that meat, making for a spectacular steak! My last couple of posts have been about grilling and I’m keeping it going! It’s supposed to be beautiful out this weekend. So you know what that means. Fire up the grill! But this post is going to be more about a method rather than a recipe. And that’s how I cook a lot of times. I usually throw things together and most times, they end up tasting pretty good. I typically don’t follow recipes but just do my own thing in the kitchen. So this blog thing has been quite an adventure because I now have a little notebook where I write down my “recipes” and ratios and all that good stuff. Something I’ve never done before! If you’re a stickler for following recipes, that’s okay too. But if you have a busy lifestyle like myself, sometimes it’s easiest to fly by the seat of your pants in the kitchen. Now, onto the main course. 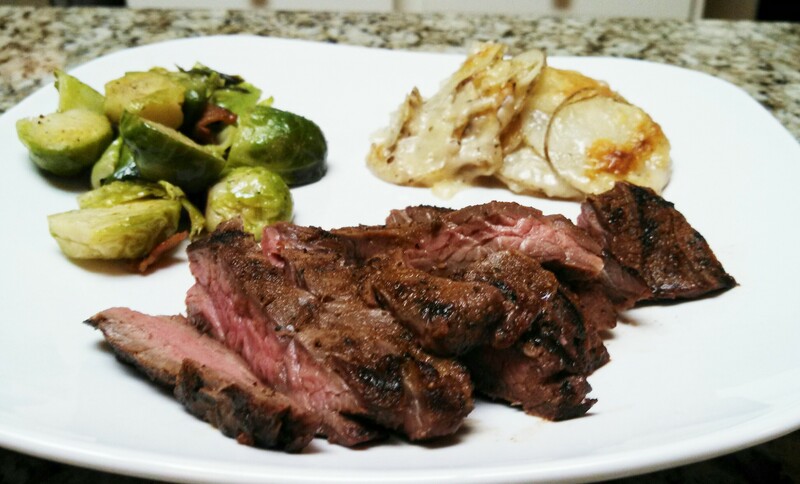 Flank steak is a tasty cut of meat! We eat it pretty often in my house. And this is how I do it. I like to use a rub. We have a favorite here. But you can use whatever brand you like. Or, you can create your own spice rub. Need ideas? Take a little bit of each of those spices and pour them into a little bowl. Mix them around and then liberally sprinkle onto your meat and rub it in. Want the flavor to penetrate? Wrap that piece of meat in plastic wrap. And wrap it up tight! Then put in your fridge until ready. 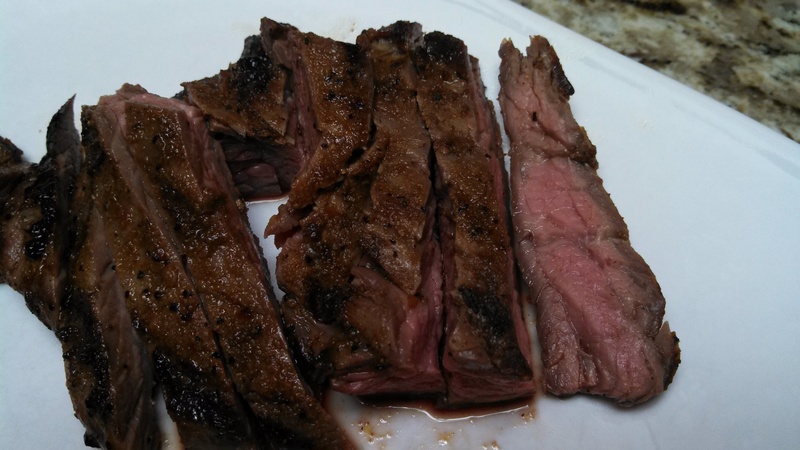 Another great suggestion for flank steak is teriyaki sauce. An awesome tip passed on to me from one of my neighbor’s was to place the meat in a large Ziploc bag, pour teriyaki sauce over, zip up and put in the freezer. That way when you’re letting it thaw out, it has all that time to penetrate and really flavor the meat. It’s a great tip and I do it all the time. 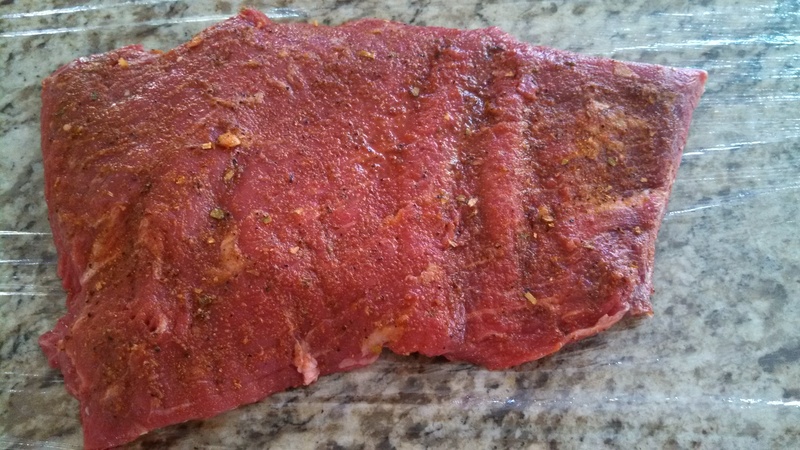 Now to cook the flank steak. Make sure your grill is heated and please remember to take your meat out and let sit at room temperature for at least 30 minutes. A cold piece of meat on the grill isn’t a good thing. Cook on each side until your desired doneness. I don’t ever time how long I have the meat on each side for, but I press on the meat with my finger. If it’s firm with a little tiny bit of give, it’s about medium. We like it medium rare in this house so I take it off before it reaches that point. 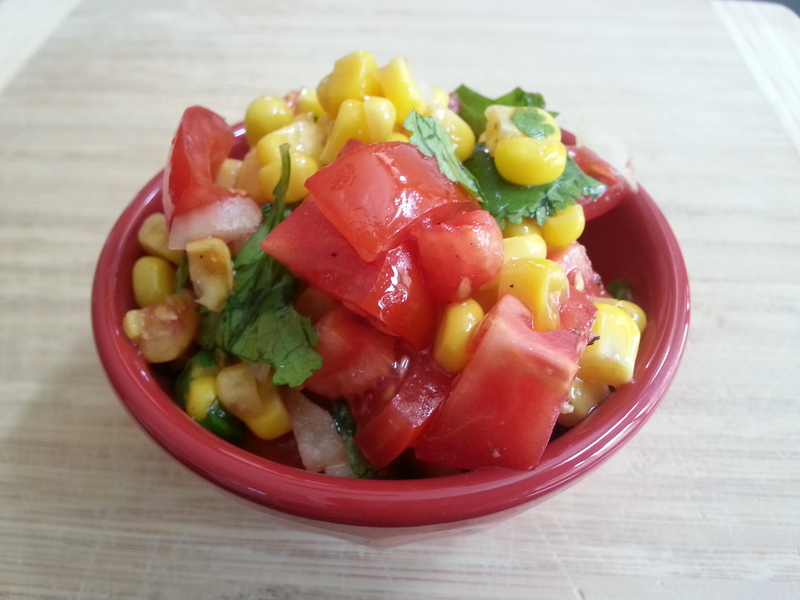 Place on a plate and cover loosely with foil. Let the meat rest for about 20 minutes. And then slice across the grain. If not, there’s no point in eating flank because it will be super tough and icky. ALWAYS make sure to cut across the grain. Don’t know what that means? Well, there’s these lines running through the meat. You don’t want to cut on those lines but across them. Pretty easy! Now you know my method. So get out there and fire up that grill!